Why does the government want to mess with wild horse vaginas? Wild horses have virtually no natural predators, and when given free range their populations can increase by up to 20% a year. With herd sizes potentially more than doubling every five years across the West, the federal agency tasked with controlling them has been searching for sustainable ways to curb this growth for years. Without such a check, overpopulation can threaten both the health of the horses and the land they live on. With very limited options, the Bureau of Land Management is about to oversee first-time and controversial sterilization experiments on a group of several hundred horses in Oregon. The move is being vehemently contested by animal rights groups, with the nonprofit horse rescue group, Front Range Equine Rescue (FRER), suing the BLM in federal court this week in an effort to put a stop to the practice, which they say violates federal law. According to FRER's complaint, the BLM is preparing to "perform dangerous and untested surgical sterilization on captive wild horses—many of them pregnant mares." "The BLM has a mandate to protect and manage wild horses in the least invasive way possible and cutting them open in surgical operations that nobody has done before is certainly not that." Bruce Wagman, a lawyer who focuses on animal law and is working with FRER, told me that the BLM has stepped over a line after years of trying to figure out a way to reduce wild horse populations. He said that the agency twice before proposed to castrate stallions on the range, but both times withdrew the proposals after push back. 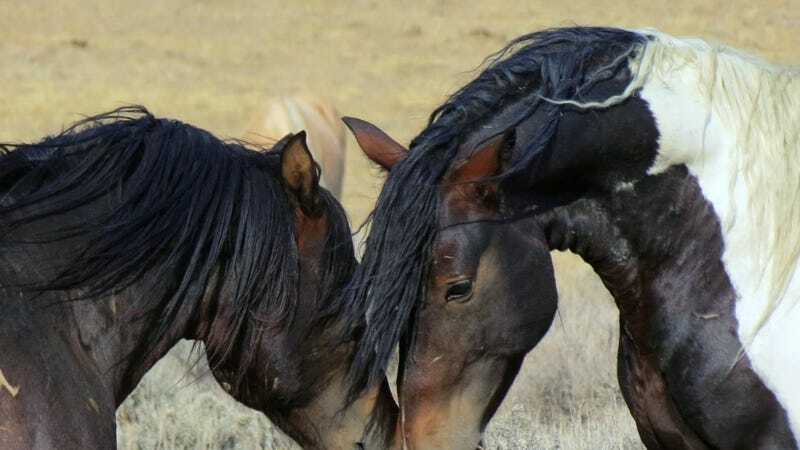 "The BLM has a mandate to protect and manage wild horses in the least invasive way possible and cutting them open in surgical operations that nobody has done before is certainly not that," said Wagman. The BLM is considering three different procedures to spay the horses. One is an ovariectomy, or surgically removing a mares’ ovaries, which is commonly done to domestic horses. The other procedures—tubal ligation, or cutting the fallopian tubes, and laser ablation, which employs a laser to scar the ovaries—have never been tested on equines, according to the BLM. A wild burro near Las Vegas, Nevada. Both Wagman and Tara Thissell, a public affairs specialist with the BLM, acknowledged the shortcomings of current population control efforts. Thissell told me that over the past 35 years, a number of fertility control options, such as hormone implants, vaccines, vasectomies, and intrauterine devices have been tried and abandoned for being ineffective or impractical. She said since the 1980s most investment has been in a birth control vaccine known as porcine zona pellucida (PZP), but with an effectiveness of only 1-2 years it has not had a substantial impact on overall population growth. "It is not feasible to administer PZP every 1-2 years to tens of thousands of unapproachable horses on 32 million acres of rangeland," she said. "That is why the BLM is pursuing new research to develop better, longer-lasting fertility-control methods to slow the population growth rate and reduce the need to remove animals from the public lands." According to Thissell, with adoption rates of wild horses declining in the last decade, the BLM is now caring for nearly 50,000 wild horses and burros on private pastures and corrals. She said the total lifetime cost for caring for an unadopted animal in a corral approaches $50,000. While domesticated animals like cats and dogs are regularly spayed or neutered, Wagman said that procedure is done in a very controlled environment under general anesthesia, whereas these operations will be done in a holding pen or on the open range. This first group of 225 mares to go under the knife are currently in BLM custody in a corral in Eastern Oregon. "They are cutting these wild horses open and you don't know how this could impact their life in society," said Wagman. "Taking out vital organs could be quite harmful." According to a recent congressional testimony by Ginger Kathrens, Executive Director of the Cloud Foundation, which works to protect wild horse herds on public lands, sterilization could cause the horses to lose their natural wild behaviors, causing them to behave more like livestock than free-roaming horses. Kathrens testified at a House Subcommittee on Federal Lands hearing in June, during which Natural Resources Committee chairman Rep. Rob Bishop (R-UT) stressed the limited options the BLM has in addressing the wild horse overpopulation. In the mind of Rep. Tom McClintock (R-CA), chairman of the subcommittee, this solution could ultimately end up being euthanasia. McClintock shot back at those opposed to the practice, saying they "seem perfectly willing to watch [the horses] succumb to excruciating death by starvation, dehydration and disease." "That is the future we condemn these animals to if we don't intervene now," he said. "With few management options, insufficient funds, and a dwindling adoption market, the BLM is unable to make progress on this issue, so yes the problem is becoming worse." At the hearing, BLM Deputy Director Steve Ellis said that the estimated 67,000 wild horses and burros on federal land in 10 states is 2.5 times more than the range can support (this does not include the 50,000 in government corals and leased pastures). "Quite frankly, we can't afford to feed any more unadopted horses," he said. "We feel that before we can implement a spay-neuter program on the range, we've got to do the research to make sure we can do it efficiently and safely." Cameron Kovach, the Assistant Director of Government Affairs at The Wildlife Society, told me that the management of wild horses is a legally complex and emotionally charged issue. He said that while many North American horse lineages disappeared from the landscape about 12,000 years ago, people perceive present-day wild horses, which are of European descent, to be "native." He said most people do not fully understand "the negative impacts [the horses] have on our rangeland ecosystems." "We are now faced with two challenges moving forward: How do we manage on-range populations that are growing exponentially, and what do we do with the nearly 47,000 excess horses currently living in off-range holding facilities," he said. "With few management options, insufficient funds, and a dwindling adoption market, the BLM is unable to make progress on this issue, so yes the problem is becoming worse."